Written by Dr. Vishnu K R and medically reviewed by iCliniq medical review team. Snakes are deadly when they are venomous. They produce venom and consciously inject into the target to kill or immobilize them. Poisonous animals on the other hand, are dangerous by all means, sometimes even by mere touch. So snakes are not that fatal after all, but ruling out the fatal factors are crucial. How to Identify a Venomous Snake? Skinnier neck than nonvenomous snakes. Additional pits behind nostril pits. Scales under the tail are in a single column. Fangs which leave a double puncture bite mark. How to Administer First Aid for Snakebites? Will antirabies vaccination cause any side effect when there is no dog bite? How can I lead a healthy life by losing my weight? Now that we have an injured victim, no matter venomous or not, we should do first aid and bring him or her to the hospital. Clean the area with soap and water for obvious reasons. Keep the victim well rested, and find a wheelchair if available. Most of the time, it is the leg which gets bitten. So, preventing walking will not increase the circulation of venom much. Tourniquet or any kind of ties above the level of the wound is now obsolete. It can cause unnecessary obstructions of blood flow, causing bigger complications and leading to amputations later. Intermittent checking on the patient regarding his or her breathing and consciousness. 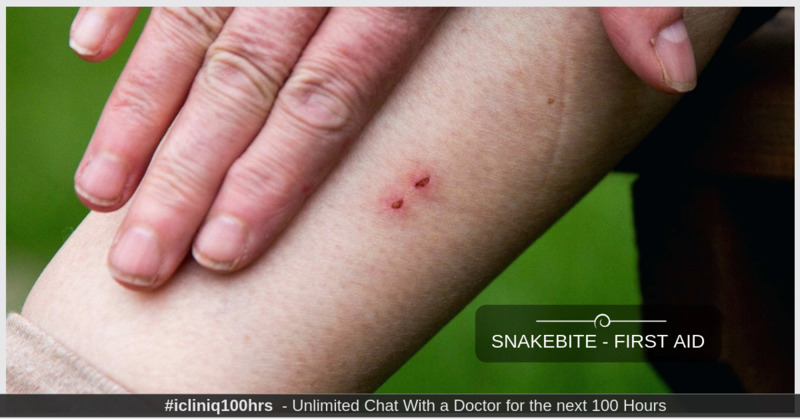 How Is Snakebite Treated in the Hospital? Always be cautious not to release the brought snake in the hospital. The doctor will always advise 24-hour monitoring, which includes routine blood tests to know if the bleeding and clotting times are within normal limits. The patient will be asked to measure the urine output if necessary. If there is any discrepancy or if the history is corresponding to a venomous snakebite, antisera should be started. An initial IV drip will be made at the beginning followed by routine monitoring, and then a subsequent dose if necessary will be given. As said earlier, not all of the bites need antisera. We have a single antiserum for the most common species of venomous snakes in the country. According to the region, some specific snake antivenom is not included in the polyvalent antivenom. But as the time advances, some brands provide them too. What Are the Precautions to Be Taken? Due to the behavior of the snakes to avoid contacts with humans, we do not encounter snakes daily. But snakes are very common in our neighborhood. They keep a "Do not come in search of me" attitude and sometimes we are the ones who offend them. A triggered snake will always bite when it gets a chance. Do not promote any snake performers who always keep the snakes triggered for entertainment. You cannot make a snake pet, but you can only tame them. They have a very functional autonomic nervous system which makes them bite or run away when they encounter you. It is so sad that we sometimes end up getting it killed for our safety. So always, it is best to avoid contact. Use repellents if you want them to be away from your home. Never underestimate a baby snake. Baby snakes inject high amounts of venom per bite as their ducts are immature and will not stop an outflow of venom. And they are difficult to identify too. If you see a hooded head, it is probably a cobra. If you see an 'S' position ready to attack or ambush, it is probably a viper. What to Do If Your Pet Brings a Dead Snake to the House? A dead snake should be handled with care as the venomous glands, and the fangs can still deliver the venom. An accidental step on it will cause a trigger of reflexes leading to injection of venom. And you will not suspect a bite before you see blood coming out from your foot. So, always bury the head deep in the soil and safe from playing children. Cremation may cause a disfigured venomous debris among the ashes which can injure the ash handler. In conclusion, prevention is better than cure. Always avoid contact. If contacted, always avoid getting bitten and try running away from it. If it is in your escape path, make ground vibrations to shoo it away. If it does not move, call for help. Be brave. With the help of modern medicine, we have successfully overcome the mortality rates. Do you have a question on Antisera or Snack Bite? Will antirabies injection work seven months after exposure? Why do I constantly feel bloated, full, and gassy? Will scar revision work give me a virtually invisible scar?